The Peony Suite is located on the lower level of Camai Bed and Breakfast and is a perfect lodging option for a small family during your Anchorage, AK vacation. The Peony Suite includes a bedroom with queen-size bed, TV/DVD, phone, private en-suite bath, and also a sitting room with daybed which converts to one or two singles, a small refrigerator, a microwave, a toaster oven, and a coffee maker. Dishes and flatware are provided. The Peony Suite is finely furnished; a prize piece includes an antique walnut armoire, which belonged to Caroline’s grandmother. 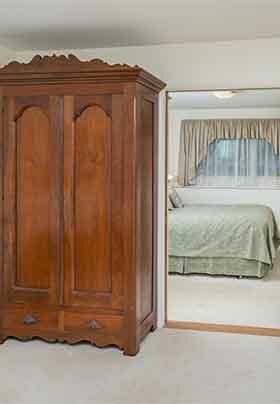 The bedroom offers a satellite TV and a DVD player. A large selection of DVDs is available for use at no additional charge. 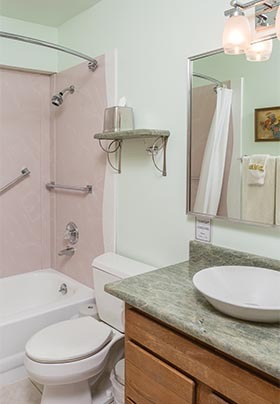 The private en-suite bathroom includes a bathtub with a shower and grab bars. The inn’s complimentary Wi-Fi reaches this room in case you want to check your e-mail or use the Internet. A full breakfast is served each morning throughout the summer, while a large continental breakfast is served during winter months. Summer rates for the Peony SUITE begin at $139 per night + bed tax. Winter rates for the Peony SUITE begin at $70 per night + bed tax. There is an additional person charge.